City of Italy Mayor, Frank Jackson, proclaims the month of May, “Motorcycle Safety and Awareness Month,” in front of Italy City Hall. Due to recent soaking rains, as well as the need of many residents to safely and efficiently dispose of downed trees and other plant debris after the storms, Commissioners voted unanimously to rescind a ban on outdoor burning approved at the April 26 meeting. Having grown rapidly during the last decade – from 111,360 in the 2000 Census to 149,610 in the 2010 Census – Ellis County must draw new lines for its commissioner precincts. The redistricting process must adhere first to the Constitutional provision for equal protection – commonly referred to as “One Man, One Vote” – but must also meet the provisions of the Voting Rights Act of 1965. Important elections are coming up May 14, 2011 for the Italy and Milford communities. Italy voters have crucial decisions to make in both the mayoral and school board elections as well as a proposition. In Milford there are two council positions needing to be filled. I am seeking to be reelected, because I want the best education we as a district can provide. I want to equip each student with the skills they need to make the next step in their lives. 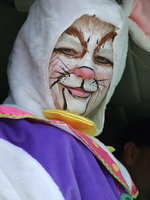 The Easter Bunny made an appearance at the Upchurch Field on Saturday much to the delight of over 125 children of Italy. Special Delivery in the Italy Fire Department’s fire truck, E.B. came to help with the festivities. Hiding eggs is his specialty and this time was no different. With high winds and an equally high load of combustible plant life, along with the longest persistent drought in recent history, the Ellis County Commissioners’ Court voted unanimously to enact a ban on outdoor burning, effective for 90 days. My name is Erick Thompson. I understand and recognize the commitment needed to be an asset to the Italy School Board. I would appreciate and honor the opportunity to be a part of the board that paves the way for a quality education at Italy ISD. I want to make the Italy of tomorrow, better than Italy when it was in its heyday. If you want things to keep going like they have been, then I am NOT your candidate. If you are happy to have the Ellis County Observer digging up the dirt from Italy and splashing it all over the internet, then again, I am not the person you should elect. I want to make Italy’s government open and transparent. I want to get more people involved. The government is for the people, by the people. 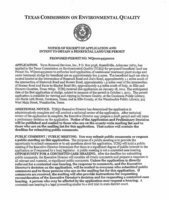 Terra Renewal Services, Inc., of Russellville, Arkansas has applied to the Texas Commission on Environmental Quality (TCEQ) for a proposed beneficial land use permit to authorize the land application of wastewater treatment plant sludge and water treatment sludge for beneficial use on approximately 621.5 acres south of Italy. The Higher Education Facilities Corporation will meet on Thursday, April 21. 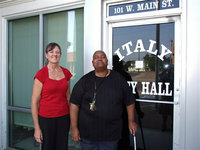 Meeting time is 5:30pm in the Council Chambers of the Italy Municipal Building located at 105 Main Street, Italy. Council members, Joan Grabowski, Theresa Cockran, Tom Little , Elmerine Bell, Albert Garcia Sr., Danny Jennings, and John Droll will hear a presentation by Dan Pleitz of Naman, Howell, Smith & Lee, L.L.P., on the Clariden School Project. The City of Italy, Texas will receive sealed proposals for a demolition project. 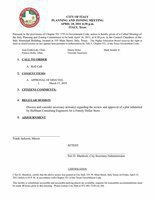 Demolition contractors must attend a mandatory pre-bid conference on Tuesday, April 19, 2011 at 2:00 pm at the job site, 100 & 108 E. Main, Italy, Texas. Plans and Specifications may be obtained from the Project Consultant at the pre-bid conference for a non refundable fee of $50.00 payable to Gary Burton Engineering, Inc. (F-2812). Prospective bidders must notify Ms. Mary Andrews (903-534-5001) of their intention to attend the pre-bid conference, to be assured of receiving a copy of the Plans and Specifications. 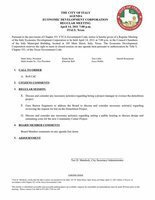 The city of Italy’s Planning and Zoning Commission will have a meeting on Monday, April 18, 2011. 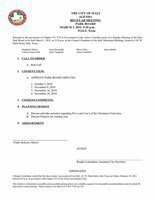 The 6:30pm meeting will be held in the Italy City Hall Council Chambers (105 West Main Street, Italy). Per the agenda there will be a discussion regarding a proposed Family Dollar Store. Ellis County Law Enforcement officials are preparing for the largest Warrant Roundup in recent history, working aggressively on any and all warrants that remain outstanding after April 30, 2011. After a short executive session during Monday’s regularly-scheduled meeting of the Ellis County Commissioners’ Court, Commissioners voted unanimously to appoint Hanna McCleary as the interim Purchasing Agent. The Italy Economic Development Corporation moved one-step closer to demolition of the former community center and adjoining building following a meeting Thursday evening. The Italy EDC will have their monthly meeting on Thursday, April 14 at 7:00pm in the Council Chambers of the Italy Municipal Building at 105 Main Street, Italy. The agenda slates items pertaining to the Italy Community Center project. My name is David B. South. I am passionate about education as I have played a huge part in all of my children’s formal education and common sense education. I am the owner of Monolithic Constructors, Inc. in Italy and the Italy Neotribune. As a Republican, Nik Kinze plans to bring prosperity, accountability and fiscal transparency to the City of Italy Texas. My name is Mark W. Stiles and I was born in Houston, Texas. 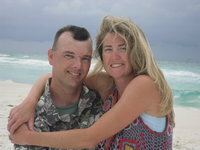 I have two children, Ross (11th grade) and Emily (9th grade) that attend Italy High School. I also have two grandchildren, Kirstin Viator (5th grade) and Easton Viator (kindergarten) that attend Stafford Elementary. Early voting for the Italy City Council and school board of trustees will be May 2-10 at city hall council chambers. Extended voting hours — from 7 a.m. until 7 p.m. — will be Tuesday, May 3, and Tuesday, May 10. Election Day is Saturday, May 14, in the same location. The Italy Park Board made last minute plans for the Mayor’s Annual Easter Egg Hunt at its monthly meeting Tuesday evening. The City of Italy Park Board will have their monthly meeting today, Tuesday, April 5, 2011. The meeting will be held in the Council Chambers of the Italy Municipal Building at 105 West Main Street, Italy. Meeting time is 5:30pm. 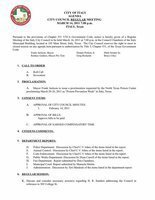 The agenda slates discussions regarding the upcoming easter egg hunt and election of secretary/treasurer. After adjourning to executive session near the end of Monday’s regularly scheduled meeting to consult with county attorneys, Ellis County Commissioners voted unanimously to authorize the County Judge to execute a contract of sale pertaining to the conveyance of all property located at 109 W. Franklin, 111 W. Franklin, 113 W. Franklin, 115 W. Franklin, 200 S. College Street, 114 S. Rogers Street, and an unnumbered lot on S. Rogers Street immediately adjacent to 115 W. Franklin in Waxahachie, Texas to Children’s Palace Investments, Inc., doing business as AZEB. Ellis County Commissioners met in a special session today, adjourning immediately into executive session to deliberate on personnel-related matters. After reconvening in open court, they voted unanimously to dismiss the Ellis County Purchasing Agent. The Italy EDC’s March meeting began with the roll call. Mark Stiles, Randy Boyd, Tom Little, Darrell Rosemond, Elmerine Bell, and Joyce Hobbs were all present. Mark Souder, Sr. was absent. It’s that time again! It’s time for Mayor Jackson’s Annual Easter Egg Hunt in Italy. But it is not at the library this year. They have changed the location to the UpChurch Ball Fields. Monday, March 28, 2011, the Italy EDC will have their monthly meeting at 7:00pm in the Council Chambers of the Italy Municipal Building at 105 Main Street, Italy. 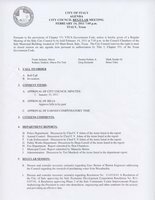 The agenda slates items pertaining to a report from Grant Administrator Darryl Ratcliff and a proposed schedule of events for the demolition of the Italy Community Center property. The Ellis County Commissioners’ Court and other officials recently recognized county employees for their years of dedicated service. During the regularly scheduled meeting of the Ellis County Commissioners’ Court on Monday, March 14, 2011, the Commissioners appointed 12 citizens to serve on the Ellis County Citizens Advisory Board. The Italy City Council voted Monday night to place a 40-yard dumpster at the wastewater treatment plant for resident use. 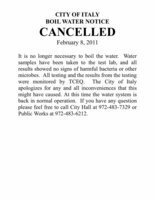 The Italy City Council will conduct its regular monthly meeting tonight, March 14, 2011. 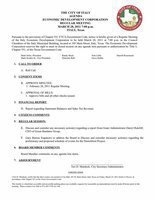 The meeting will be held in the Council Chambers at 105 Main Street, Italy, Texas and will begin at 7:00pm. During the regularly scheduled meeting of the Ellis County Commissioners’ Court on Monday, February 28, 2011, two members of the board of directors of the Prairielands Groundwater Conservation District and the organization’s executive director gave an update on their progress. The Italy Park Board is seeking donations of plastic eggs and candy for the Mayor’s Annual Easter Egg Hunt. The City of Italy Park Board will have their monthly meeting today, Tuesday, March 1, 2011. The meeting will be held in the Council Chambers of the Italy Municipal Building at 105 West Main Street, Italy. Meeting time is 5:30pm. The agenda slates discussions regarding the recent Christmas Festival and proposed future projects. The Italy Economic Development Corporation voted to hire Darryl Ratcliff of the Green Bandana Group of Dallas as grant writer at its monthly meeting Monday. Today, February 28, 2011, the Italy EDC will have their monthly meeting at 7:00pm in the Council Chambers of the Italy Municipal Building at 105 Main Street, Italy. Agenda items include discussion and action consideration of a proposal by grant administrator and discussion and action consideration of letter writing campaign in support of Italy Post Office. A meeting is set for Wednesday, February 23, at 7 p.m. to discuss the Insurance Services Office (ISO) fire rating in Ellis County. The meeting will be held on the second floor of the historic Ellis County Courthouse in Waxahachie. A Citizens’ Advisory Committee for the redistricting process will be appointed by Ellis County Commissioners, following action taken during Monday’s regularly scheduled meeting. The Italy City Council approved an ordinance calling for a general election May 14 for the purpose of electing a mayor and two council members for terms of two years and calling for a special election for the reauthorization of the local sales and use tax. The rate is one-fourth of one percent that will continue providing revenue for maintenance and repair of municipal streets. The Italy City Council will conduct its regular monthly meeting tonight, February 14, 2011. 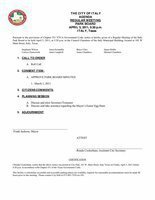 The meeting will be held in the Council Chambers at 105 Main Street, Italy, Texas and will begin at 7:00pm. It is no longer necessary to boil the water. Water samples have been taken to the test lab, and all results showed no signs of harmful bacteria or other microbes. All testing and the results from the testing were monitored by TCEQ. The Texas Association of Counties is providing specialized safety training for Ellis County employees this month, utilizing a driving simulator that offers county employees a unique experience to prepare for unexpected driving situations. The Italy Economic Development Corporation moved forward with plans to demolish the buildings at 100 and 108 East Main Street at a called meeting and public hearings Monday evening. The May Uniform Election Date is set for Saturday, May 14, 2011. The ballots this year will be comprised of both city and school board elections. 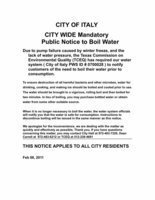 Due to pump failure caused by winter freeze, and the lack of water pressure, the Texas Commission on Environmental Quality (TCEQ) has required our water system (City of Italy PWD ID # 0700028) to notify customers of the need to boil their water prior to consumption. The Italy EDC will have a called meeting on Monday, February 7, 2011. In addition to the meeting there will also be a hearing. The agenda slates the community center project as its primary topic of business. The meeting and hearing will be held in the City Hall Council Chambers at will begin at 6:30pm. City of Italy residents that were scheduled to have their trash picked up on Tuesday, February 1 will have their trash picked up this Friday, February 4. If further information is needed contact Italy City Hall (972/483-7329). 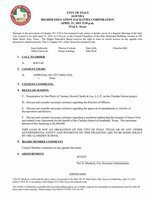 The City of Italy Park Board will have their monthly meeting (rescheduled from January 4 and January 18) on Tuesday, February 1, 2011 in the Council Chambers of the Italy Municipal Building (105 W. Main Street, Italy, Texas). Meeting time is 5:30pm. Agenda items include discussion of the recent Christmas Festival and project planning for 2011. The meeting began with the roll call. Mark Stiles, Mark Souder, Sr., Randy Boyd, Elmerine Bell, Tom Little and Darrell Rosemond were all present. Joyce Hobbs was absent.